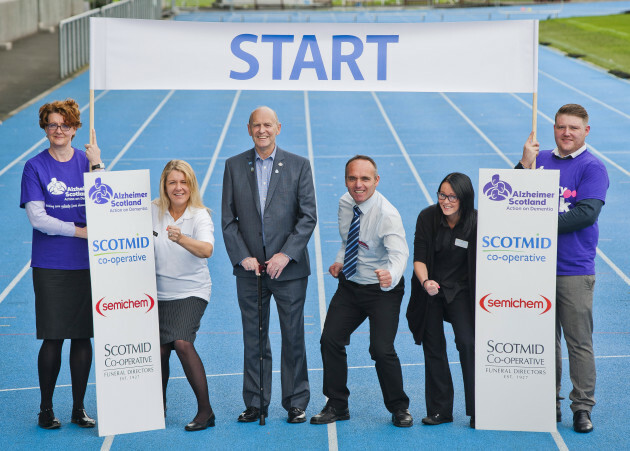 Scotmid Co-operative is set to pass the baton to dementia charity Alzheimer Scotland as the two launched an exciting new charity partnership at the Scotstoun Sports Campus in Glasgow on Tuesday 1 September 2015. The year-long partnership is sprinting straight out of the blocks as the launch coincides with Alzheimer Scotland’s Memory Walk month, which will see thousands of people coming together throughout September to show their support for people living with dementia in Scotland. Scotmid Co-operative and its brands Semichem, Lakes & Dales co-operative, Scotmid Co-operative Funeral Directors and Post Offices have set a fundraising target of £250,000 to be raised over the next 12 months, to support new Dementia Friendly communities. With over 850,000 people now living with dementia in the UK and 20% of the public providing unpaid care to someone with the illness, this unique partnership will put communities and people at its heart and will see staff rally together to undertake an exciting calendar of fundraising activities. Staff and customers now have the chance to join forces to become Dementia Friends and improve the lives of thousands affected by the disease which currently has no known cure. Malcolm Brown, Head of Corporate Communications for Scotmid Co-operative said: “We are very excited about our new charity partnership with Alzheimer Scotland and our team is already full of ideas to ensure we reach our target of £250,000. Henry Rankin from Clarkston, Glasgow, who attended the launch, has been living with dementia for four years. He said: “I am passionate about the work Alzheimer Scotland does to support families just like mine. The charity has been a real lifeline to me and my wife, especially on diagnosis, as I found the whole process very confusing.